Ho ho hOHMYGAH why does he need a sack if he has a fourth dimensional secret gadget pocket? Christmas in Japan is a bit different from the West. The major religions in Japan are Buddhism and Shinto, so Christmas there is an entirely commercial event. The main celebration revolves around Christmas Eve and not Christmas Day, as opposed to U.S. practice but common in some European countries. Decorations typically go up at commercial centers and storefronts at the beginning of November, then disappear the morning of December 25th, to be hastily replaced by decorations for Japanese New Year's. 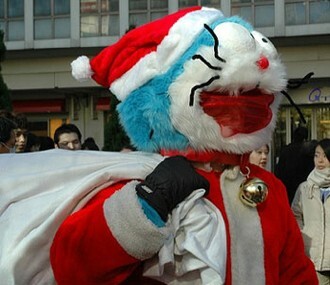 It is common to give Christmas presents in Japan, and Santa Claus has even been imported to take part in the holidays. Within the family, parents give presents to their children, but the children do not give presents to the parents. The reason for this is that only Santa brings presents, so once the children no longer believe in Santa, the presents are no longer given. Most Japanese families have a Christmas tree, and it is becoming more and more common to have Christmas lights on the outside of houses like in some Western countries. Thanks to KFC and Japan's lack of turkeys, fried chicken has become a traditional Japanese Christmas dinner. Christmas is also considered a very romantic holiday, and lovers are supposed to spend the evening together doing suitably romantic things. It is seen as really crucial for single women in Japan to have someone to spend Christmas Eve with; it is also really important where they spend Christmas Eve and what present they receive. The whole evening must be very special, gorgeous and romantic. Japanese women who have a boyfriend tend to show off, so women who don't are not happy to talk about the topic. In this respect, Christmas Eve in Japan is very much like Valentine's Day in the west (right down to the miserable singles who don't want to celebrate). Perhaps for this reason, staple Christmas songs in Japan include "Christmas Eve" by Tatsurō Yamashita and "Last Christmas" by WHAM!, which both speak to heartbreak and loneliness on Christmas. After hearing them seemingly on repeat at any commercial venue, you're sure to be sick of them well before Christmas. There is also a joke that compares Christmas to a woman's age. Cake shops throughout Japan always try to sell all their Christmas cakes before Christmas Eve. Any cakes left after Christmas are seen to be very old or out of date. Unmarried women over 25 years old used to be called 'unsold Christmas Cake'. Since the average age for marriage has changed, with people marrying older and older, and even day-old cakes are delicious, this joke is falling out of use. This holiday is sometimes confused with Oseibo, which is similar to Christmas but a little different and less well-known even among the Japanese. For more Japanese Holidays, go to, um, Japanese Holidays. And while you're here, have a look at some other Christmas Tropes.